How does the US Army mold a video-game generation with its thumbs on the joystick into a proud fighting force with its fingers on the trigger - and lives on the line - in America's War on Terror? Michael J. MacLeod, already an accomplished professional photographer and journalist, decided to find out the hard way: by enlisting in the armed forces at age forty-one. What he observed and experienced as an embedded reporter and a serving soldier makes for an unflinching and inspiring portrait of endurance, sacrifice, discipline, and courage. 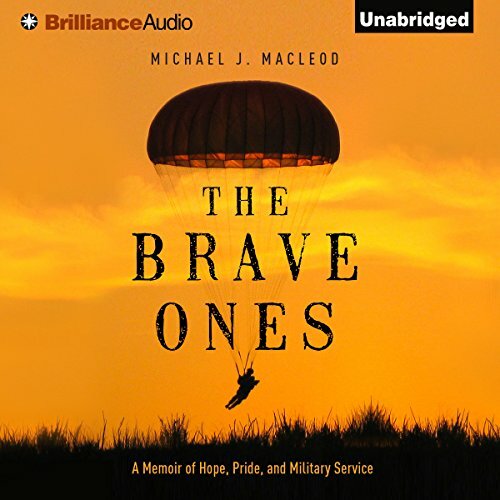 From the trials of basic training on the home front to the ranks of the legendary 82nd Airborne Division to taking fire in the hot zones of Iraq and Afghanistan, MacLeod chronicles the soldier's evolution as only one who's been in those boots can. Candid, wise, and powerful, his memoir takes listeners on an unforgettable journey through war and allows them to witness bravery firsthand. ©2015 Michael J. MacLeod (P)2015 Brilliance Audio, all rights reserved. This is a brilliant book that I would recommend to anyone. An extraordinarily heartfelt ride. A real story of war. enjoyed the narrator, story was well written I would find myself laughing at times then wanting to cry, I like how nothing seemed to be sugar coated it was real. As a veteran myself I salute you Michael McCloud. mature account of war and it's warfighters. From the view of a 40+ man who joined the 82nd as a enlisted journalist. Probably the best account I've read or listened to, expertly narrated. Best modern military book I've listened to lately. Outstanding story that was written and performed outstandingly well. A win, win, win! Trifecta! Bravo! Patrick Lawlor brings them to life. Unable to put it down. When people now ask me why I left the Army, I can tell them to listen to chapters 3 & 4. Would you try another book from Michael J. MacLeod and/or Patrick Lawlor? Probably not. Maybe the narrator, but definitely not this author. The author operates from the mistaken impression that he is a spectacular writer and that apparently there are no other books, films, etc. that relate the experiences of boot camp, jump school, war zone, etc. Way too much attitude from a REMF Fobbit, who's not in combat arms or even combat support, but only went through jump school because he was assigned 82nd Airborne (public affairs). What was most disappointing about Michael J. MacLeod’s story? Mostly his snarky attitude about pretty much everything from boot camp, drill sergeants, jump school, and being a fobbit, while real soldiers, sailors, airmen and Marines were actually risking it all on a daily basis. I'm very disappointed that the publisher made this appear like it was a first-person experience of one of our airborne troops, while it was actually just the incessant whining of a middle-age guy who, probably from lack of work, enlisted in the US Army thinking it would be a great experience for the book he knew was within him. But rather than going for infantry, armor, artillery or something that actually contributes, he gets guaranteed "military journalist. "There are too many real first-person accounts from all sorts of men and women in this and past wars who actually did "see the elephant" and survive for this spoiled child's account of mostly hearsay and third-person stories to matter a whit. A good editor could have salvaged this by removing most of the snarky, superior tone of voice and deleting about half the stuff that does a poor job of re-telling boot camp, jump school, etc. Good thing he picked PA, he would never have made it in the Grunts, much less Rangers. What didn’t you like about Patrick Lawlor’s performance? His high whiny voice just exacerbated the whiny, snarky tone of the author's words. Mostly it sparked disgust. There are quite a few really good narratives by people of all sorts who have gone through the US military experience in war and peace, in all sorts of jobs, in all sorts of places. I cannot imagine how this even got published, unless it was self-published or specifically targeted to an audience that thinks being a fobbit who coincidentally has jump wings merits a "self-esteem" award for being sort of close to "there." For a polar opposite of this piece of junk, try "Goodbye Darkness" by William Manchester. This is how a skilled writer tells the tale of his personal experience in war. In 2008 Michael McLeod, a 41 year old husband, father, and Montana native with no military experience, decided to join the US Army as a buck private. He hoped to become a military journalist and photographer. This is his story of his 5 years as an enlisted man beginning with boot camp and including a tour without combat in Iraq and a tour with heavy combat in Afghanistan. The perspective of a well educated 40+ year old is fascinating and even humorous at times. McLeod was old enough to be the father of most of his peers and even many of his superiors,so his perceptions are certainly different than others. I recommend The Brave Ones without reservation to all. It is a wonderful and well narrated audiobook! On a second career enlisting just under the wire near 40 years old, this former construction worker from Northwest US finds he has a skill as writer and photographer. This 82nd Airborne Div. sergeant assigned to Iraq and Afghanistan as a journalist tells of -- and participates in -- combat action. His contrast to the "video game" generation provides many unique observations of training at Basic Training, chow hall, keeping in touch with family, even firing his weapon at the enemy. As a Paratrooper,a member of the 82nd and a older Enlistie I can relate so much to this book. I as a solider who served inOEF. I find this book thrilling sad and full of good/bad times of my deployment. I feel for the family, friends and soldiers who lost loved during this deployment. I hope the 99% of this country reads and realizes the sacrifices soldiers and families make.